Canoeing 6.0 - is here now…. I call it Canoeing 6.0... you can call it anything you want, but I believe that if you look critically at the last 10 years, you will see that inevitable change has come to the canoeing community. The average length of a canoe trip has been steadily dropping for years - the rise of sea kayaking and white-water playboating has made canoeing for many an activity for a few hours in an afternoon, like a round of golf. And I think that it is fairly easy to see that one of the biggest changes for wilderness canoeing is the exponential growth in communications technology. Look at how much it has already happened in the last 10 years. In Ted Kerasote’s “Out There...in the Wild in a Wired age”. he deals with the one of the key issues that we face in the early 21st century ...the effect that our use communication technology has on our relationships with others, and on the existing social fabric; or in this case, on the fabric of a canoe trip. In 2003, when the author’s partner takes a Sat phone on a trip down the Horton, Kerasote finds the nature of his experience changing. The two of them do not have it for emergency only. They are expected by those back home to “Stay in Touch”... which Kerasote finds for him, at least changes the entire nature of the trip. “Even on the Horton, the blessing of uncluttered mental space is no longer a function of remoteness...but of desire....” This is important to him because “What matters and what is of little consequence becomes much clearer to me out here. In less quite places, the noise surrounding my life disguises the difference”. That was 2003. Today the Sat phone, the SPOT, the GPS, the iPod, and the ability to text and blog and use solar chargers while in previously remote areas of Canada’s wilderness, have all become second nature... and to some of us it is frightening the speed with which they have become as accepted on the trip as a new design of sleeping pad or tent. Because unlike a tent or a sleeping pad, the adoption of remote communications technology can fundamentally alter the tripping experience...if you choose to let it. I would never argue against safety... wireless communication would have saved Hornby, and Hubbard, no question. But beyond safety, are there other effects...either positive or negative? In my Grade 8 English class we often discuss social media and networking ... which is natural, since half of my student’s parents work for RIM. We recently read a USA today article on the effects of communications technologies on human relationships. Its conclusions? We are in the middle of an enormous shift ...and while it is impossible to truly grasp the significance of events while they are occurring...the point that came through loud and clear to my students was that the connections that we now enjoy with those who are elsewhere are weakening that connections we have with the people we are actually with. We’ve confused continual connectivity with real connection. In the article, Sherry Turkle, author of Alone together: Why we expect more from technology and less from each other, points out that “ Technology is good at giving you more and more friended people, more and more contacts all over the world, ...it’s not so good at giving you contacts that count.” With the right technology we can now blog from some remote arctic river... we can Facebook from a campfire anywhere in the back of beyond. But at what cost to our wilderness experience? The group I canoe with has so far adopted the approach that we will take technology (which is limited to cell phones at this point, for us) for emergency use only...on those more and more frequent occasions when we would have service. We want to focus our time together on the company of not only each other but also, and more importantly, the 5th member of our little group ... the beautiful location that we have spent all this energy getting to. Some of the places we visit, such as the eastern shoreline of Georgian Bay, are indeed unique... We try to give them our full, undivided attention for the always too short a time we are there. Are my fellow paddlers Luddites? Maybe...but I don’t think so. We use technology freely at home. We choose not to use it when we canoe. Again... this is not a rant against technology in and of itself...it is a cautionary stance against the effect that the use of technology can have on the nature of the canoe tripping experience. If one of us calls home...the rest are in trouble for not doing the same. More than that, the authors whose writings I most admire contain passages that speak to the peace...the remoteness... the isolation of the canoeing experience. How would 21st century communications affect their experiences? I suspect the impact would be significant. In the 1956 classic “The Singing Wilderness” Sig Olson created something quite different from the “land ethic” of earlier ecologists like Aldo Leopold – Olson created a land “aesthetic”. Olson observes that..”Looking for old pine knots to burn, picking berries, and paddling a canoe are not only fulfilling in themselves, they are an opportunity to participate in an act hallowed by forgotten generations”. He goes on to say that the movement of a canoe is like “a reed in the wind... silence is part of it... and wind in the trees. A man is part of his canoe, and therefore part of all that canoes have ever known.” In Olson’s Singing Wilderness, “peace is not to be mistaken for silence...rather it is a oneness with nature that is energizing and sustaining”. Similarly, Paul Gruchow, in “Travels in Canoe Country” writes that a Wilderness Journey appeals to that part of our being that is “not dependent upon wisdom , but rather those activities that depend upon experience with the physical world... how to steer a canoe into the wind, how to make a fire in the rain, whether that sound in the night is sinister or benign.....and to our capacity for delight and wonder...to the sense of mystery surrounding our lives...to our sense of beauty and pain”, the connection between the two forgotten, he writes, “until after we have all day battled a fierce wind and at last, with aching muscles, discover the bliss that descends with last light”. The perfect medicine, I think we would agree, for the nature deficit facing so many of our urban youth in Canada. His quote is an observation not only on the benefits of a specific location to travel, but more importantly on the mode of travel. I would like to suggest that another great Canadian thinker, Marshall McLuhan, would have agreed with Trudeau. I don’t know if McLuhan ever canoed, but his famous observation that the medium of delivery of any message has at least as much impact as the message itself, if not more... is equally applicable to canoeing as it is to media. I think that the way you canoe sends a deep, unconscious message to your brain...and it defines the canoeing experience for you and those with you. Chew up the map and bag lakes in an all day race to cover territory, and you are not going to be a fan of Sig Olson’s assertion that “without stillness there can be no knowing”. I imagine that if you take the leash of 21st century communication with you on your journey, you would not embrace his dictum that “without divorcement from outside influences, man cannot know what spirit means”. Well said, Dave. Richard Louv in his 2005 book, "Last Child in the Woods" described the need for children to experience the outdoors and coined the term, "nature deficit disorder". He has expanded that concept to apply to not only our children, but adults as well. As we became more dependent on technology, we lose touch with the natural world. I prefer to trip without a GPS, and only occasionally have brought a sat phone. Guidebooks are helpful, but for me, a route that only exists on maps and from a few scribbled notes or a brief conversation with someone who has done the route, is more empowering. I connect more with the natural world, and those who came before. The point is, fewer and fewer people are getting out in nature, which for me is a very dangerous trend. If you cannot see it, touch it, feel it, you do not really know it exists. And if you do not know it exists, you have no need to protect it. I don't know whether the following is relevant, but doesn't BC have a strong kayak culture? I have seen many ads for kayak excursions. More generally, if kayaks are indeed outselling canoes, perhaps many of those purchases are for day tripping. That surely applies to SUP purchases, though I have seen a report (Sayward loop I think) of an overnighter. I view the purchase of boats for day tripping as beneficial to the sport of paddling. It's even better if those people get hooked on the sport and go on to purchase kayaks and canoes for overnighters. 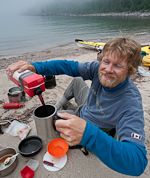 Allan, yes BC and the PNW in general has a very strong kayaking culture, going back to the mid sixties. Kayaks here outsell canoes by a large degree(perhaps twenty or more to one). Kayak sales have dropped in the last few years, as SUP sales have increased. And while many of these kayak and SUP paddlers only do day trips, a few might venture into overnights. SUPs may indeed have been used on the Sayward, but as I mentioned earlier, the Bowron has been paddled in(on) a SUP. However, especially in US PNW, there is not a strong tripping culture. As Pat said, most people only do day trips. In my club, which has been in existence since the early seventies, only four or five of us ever do overnights, except for those who link two water water runs with car camping. My opinion is that those few who kayak, or canoe, or SUP, just want an afternoon experience and the logistics, or "hard fun" doesn't sound good to folks who want to finish their day in a five star restaurant. I'm in the land of Microsoft and Amazon and Adobe, etc. and the number of young adults with NDD is astounding. When I mention I went back country skiing, or spent a month paddling a Yukon river, they look at me with an expression that says, "you must be crazy, why would you do THAT?" How busy are the Bowron loop and Wells-Gray? Those are major inland Routes known to me. Do you have to reserve far in advance, as you must for Algonquin in ON? Isn't the PNW (and also BC) paddled a lot by the ww kayak freaks? The Bowron supposedly let's 50 people a day on the route. When I first did it in 1971, there were probably 10 that started the route each day, not gigantic growth in 40 years. And it is quite famous. Wells Gray is much less popular with canoe trippers. Lots of powerboats on the Clearwater Azure. On Murtle, several years ago, I counted two dozen canoe carts at the put in in August. Still not huge numbers. Lots of sea kayaking, and white water kayaking. Much, much less canoeing, or the desire to try it. Kayaks look cooler than my well used Outrage, I guess. Never mind my big tandems. My opinion is that those few who kayak, or canoe, or SUP, just want an afternoon experience and the logistics, or "hard fun" doesn't sound good to folks who want to finish their day in a five star restaurant. I'm in the land of Microsoft and Amazon and Adobe, etc. and the number of young adults with NDD is astounding. I think this is the key in "canoe 6.0" culture. It is like golf, or geocaching something you do for an afternoon, 3-5 hrs, then go home. Who cares? Well...the less time you spend in nature, the less you care about what happens to it. Sure we are all busy these days with work, kids etc. In our case we "make" time for extended canoe trips. We put them on a calendar, save our pennies and adjust our lives to make this time available. I don't think people have less time these days there are just to many distractions/competing activities to choose from...and more and more people are not choosing a true wilderness experience like canoeing. Yes gear is expensive, but so are big TV's, new cars, big houses etc...Our family chooses to live a simple lifestyle in an a small house house, drive used cars, wash dishes by hand, share an I phone etc. This in turn frees up $ that allows us to get the right gear and change the gear up as our family and paddling ambitions grow. Yes they seem to be sadly limited for most professions. However, that is also a choice. I originally was planning to be a ski guide until I realized that seasonal, away from home work wasn't for me. I chose a profession where I could live anywhere, work anywhere and had lots of over time available for me to bank and use as holidays. I chose a profession that fit my lifestyle. Now I get ample "paid" time off (2wks this may for a 7 day trip down south (Kamloops to Savaona) and 34 days this summer for our longer canoe trip). Who we are reflects what our trips look like. I am an admitted introvert. I like my time away from the masses and our family trips reflect this either by location or time of year that we go. I also grew up (thanks mom and dad) skiing, canoeing, camping etc. These experiences laid the foundation for my passion now. I am comfortable in the wilderness, on lakes, in whitewater and thus am confident that venturing out with my family on extended wilderness trips is "safe" and "sane" despite what responses we sometimes get. I don't want to make this a direct comparison of the choices individual families make, so suffice it to say not every person/couple (part of my challenge in living somewhere with more access to wilderness would be my wife's profession) is lucky enough to get the kind of job that allows that kind of time - yes, those are choices, but most of the "choices" facing the majority of people don't favour extended periods of time for tripping. And people also choose their careers based on their passions and personalities, so tough trade-offs. The fact that you've been able to work things out in your favour is great for you, and anecdotal evidence that it is possible if you make it the absolute priority, but that doesn't make it any more likely for masses, which I think is the point of the discussion. To put more a point on it, some could argue that wilderness canoe trips are for an elite minority, requiring trippers to be some combination of lucky, priveleged and/or obsessed. But on a brighter note, I do know several families who have never been canoeheads, but recognized canoeing as a good activity for young families and have, to my surprise, picked it up for that reason - they may never be big-time trippers, but they bought canoes and go camping! As for routes, there are definitely plenty of neat places to go by canoe, but, to me anyway, they don't hold the same appeal as "real" Canadian wilderness, like the Canadian Shield. Too many places in BC you've got power boats on the lakes, or house boats, or jet boats, or rafting companies,..., a railway down one side of the valley, a highway along the other, and car campers at forestry sites along the destinations you canoe - all of which takes some of the romance out of it, I don't paddle for a few days to camp next to any yahoos who might drive up, and I think all that reduces "the canoe culture" that you see elsewhere. It'll remain a passion for a small minority, but I don't think it's an obvious, sensible, appealing choice for the masses. As much as I love canoeing, I understand why spring in BC doesn't mean canoes on top of cars everywhere you look. It never was that way, and it never will be. I think it's just the geography. Hmmm. Now Vancouver is bumming me out a bit, I miss loons, but I'm not sure whether I should move to Smithers or Kenora. Oh yeah, wait,... jobs, wife, kids, parents/grandparents, siblings,... probably isn't in the cards! Not that we don't think about it at times. But at least we still ski & canoe. Smithers, I think that Pat is correct. There are routes in BC, to be sure. And you can look at a map and find dozens of them. Many, as Pat said, have some evidence of civilization on them, from trains to towns to powerboats. I have paddled some and researched lots of routes in BC and Washington. Since the West, and here I mean BC and the PNW of the US, is quite mountainous, far more so than the East, extended routes involve some major portages and/or ability to paddle Class V rapids, not something you can do in a loaded tripping boat. While we have dozens of routes, Ontario and the eastern provinces have hundreds of established routes, and thousands of ones to be discovered. Around Smithers, there are a number of routes, Nanika-Kidprice has several possibilities, the Stikine, the Skeena, The Spatsizi, Swan Lakes, and a handful of others. The problem is, longer trips, except for those mentioned and a few more, are hard, hard trips, requiring major commitment and skills. 1) The loss of Western canoeing culture - I'm not sure there has been a loss, because there's never been much of a canoeing culture. Canoeing around here will always appeal to only a small minority. It's fine for those who are dedicated canoeists, but it's not great for attracting potential new canoeists. Relative to other activities, which all have ups & downs, canoeing is probably puttering along OK and holding its own. It's probably not realistic to expect much more - time seems to have proven that BC/PNW isn't a great place from where to grow the sport. Input to this discussion may vary depending on where you live, the time & money you have to travel, and whether you're into wilderness tripping, canoe camping, recreational canoeing or whitewater canoeing, but that's details. 2) Nature deficit disorder and the general decline in all outdoor pursuits, especially extended wilderness travel. That's a whole other depressing topic, in which we can include the influence of technology and other realities of the modern world, but I don't think it affects canoeing in BC any more than it affects everything everywhere. Anyway, I love canoeing in BC, but I get why there's not a big canoeing culture here. And I sincerely hope society finds a way to turn things around get more people connecting to the natural world! I'll try to do my bit with my family & friends. A canoeing friend of mind moved to BC and switched over to ww kayaking right away stating "it is more of a kayaking scene out there"
Reviving an old thread, but I moved out to Kamloops from Ontario last year. I've managed to paddle Murtle Lake three times, and I plan to head down the Interlakes highway and up to Mahood Lake this weekend. While Murtle is beautiful, it certainly doesn't compare to the isolation one could find in the Canadian Shield (i.e. Algonquin Park). We would always make sure a large portage was in our trip plan, which would guarantee privacy. Murtle Lake is also quite large, and wind can severely interfere with your plans (big whitecaps while crossing the lake, weee). I am hoping that in the coming years I am able to find some local circuits, where I can portage my way to privacy (especially no motorized vehicles). A quick look at the map shows hundreds of lakes scattered nearby, especially around 100 Mile House. I moved West because I loved the landscape, and the weather. Skiing here is incredible, but I refuse to let go of canoe tripping, it's my absolute favourite thing to do once the ice melts. I know many people who have been quite curious about my canoe tripping adventures. As someone who went to summer camp as a kid, I learned a lot of skills at a young age, and continued to expand them through my 20's and beyond. Many people who don't have any canoe tripping background seem to feel intimidated - like they just don't know what to expect, or how to put a trip together - despite their interest. I think it is important that those of us who are experienced trippers make an effort to occasionally recruit a rookie or two. I've done this in the past, and continue to do so, and in my experience, some of those rookies have become quite experienced and passionate paddlers over the years. All they needed was a way in. I really think it is about mentorship and outdoors experience lacking in a large pool of our youth and fewer and fewer opportunities for interested people to get the training and experience they need. I teach a 4th year, 2 week summer course on limnology to undergraduate students from several participating Ontario Universities every year. The course is designed for biology majors and ecologists. During the second week we camp over night at a field station and sample gill nets every 4 h through the night. Even though most of my students (class size = 15 students/year) are budding ecologists, about 80% will have never slept outside during their lives. This trend seems to be growing with time and it is not uncommon nowadays where not a single person in the entire class has ever slept outside. I used to ask students to bring a sleeping bag from home for the overnighter, but recently I ended up buying a set for the class because it was becoming common that nobody had even their own sleeping bag. Again, I have to stress these are people who are choosing to become biologists and ecologists for a career (or at least were interested enough to major in the subject) but apparently have never felt the urge to commune with nature. Now, I'm not trying to whine about our youth. I think many of them have a genuine interest in nature. They always enjoy the camping experience and really seem to light up when I take them around the woods during the off hours doing tree and plant i.d. When I think back to my own experiences, I always really had a fondness for nature. My parents couldn't tear me away from the local forests and Jacques Cousteau was my hero. But my dad wasn't much of an outdoors type. He was a musician and very much into the urban club scene something completely alien to me as a child. If it wasn't for my mom, a northern Ontario girl, I probably wouldn't ever to get to experience car camping that she (and I as cheerleader) insisted on during our various drive across the province or country family vacations. It wasn't until I became a teenager that I found mentors in my life from outside my family to show me how to backcountry camp, hunt, fish, paddle, backpack, winter camp and learn (and it was a learning experience) to enjoy nature. This happened mostly because we moved back to N. Ontario where I spent my formative teenage years and I still remember saving my earnings from my first summer job to buy a coveted coleman canoe. Since, I've camped all over the world, done many a solo adventures and yet still haven't accomplished what many on this forum have done. I can't even claim to have been on a wilderness trip lasting beyond 16 days. My point though is that the pathway towards becoming a tripper isn't something you pick up on a whim. It takes a serious degree of motivation to learn the required skills, acquire the gear and develop the confidence to undertake even simple 2-3 d backcountry camping that we all consider as no-brainer off the cuff outings. Yet for our young people they need mentors to show them this and I think if a critical window of time is missed it becomes harder and harder to overcome such challenges. Heck, I can go back to my students and young graduate students. Fewer than 30% of them even have a driver's license now that graduated licensing in Ontario is a 2+ year process. Basically, if a kid hasn't jumped through the hoops required to get their drivers license during high school, the likelihood that they will find the time to do it afterwards shrinks. So this is yet another challenge. When I was driving my $500 used Lada (and it was as bad a car as could possibly be made) at 17 years of age, this Russian piece of scrap metal, at least gave me the freedom to hit different parks and wilderness areas. (though there was never a guarantee of it getting me back, but as an optimistic youth I never thought of that). How do our kids experience this today? Maybe summer camps are the answer, but even finding those among the hockey camps, basketball camps, arts & craft camps, football camps, stick your kid in a place while you are at work camps, ...... seem highly competitive to what most of use simply referred to (and was only the stuff of my daydreams as a child) as "camp".